❤The support wheels are individually adjustable. ❤Ensure your child is safe when learning to ride. ❤Supplied with fitting kit for easy installment to cycle. ❤ This bike stabilisers is suitable for all bikes from 12 to 20 inches,provide the necessary security and stability which it needs in the first road tests on the bike. 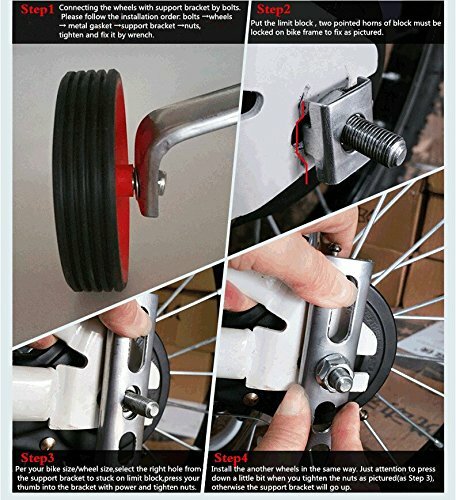 2 x Stable jockey wheel for bicycles from 12 “- 20″ mounting material(included Components)Universal fitting all 12″ – 20” Wheels. Stable metal supports for more security. The support wheels are individually strong and adjustable. This practical training wheels, for bicycles from 12 “- 20”, provide the necessary security and stability which it needs in the first road tests on the bike. Gives your child the best start to gaining their balance and confidence on two wheels.